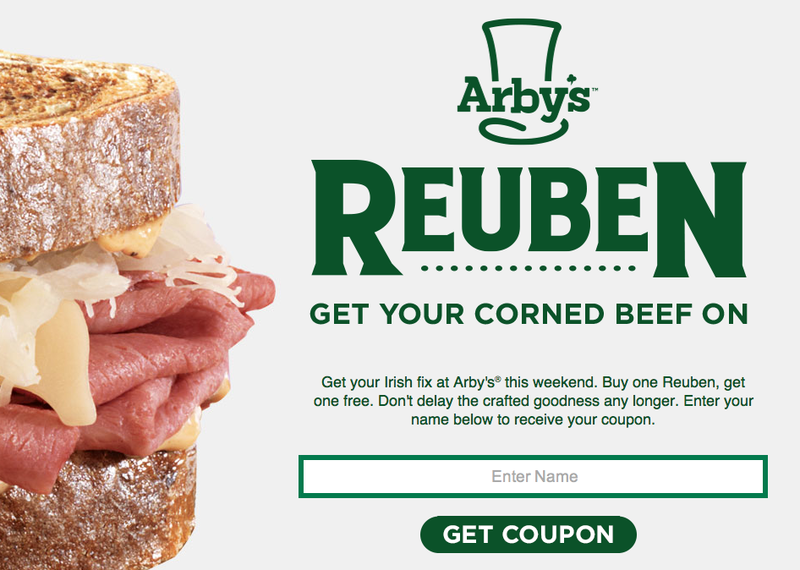 To celebrate St. Patrick's day, Arby's is offering a buy one, get one free deal on the Reuben sandwich this weekend from March 15-17, 2014. The Arby’s Reuben sandwich is stuffed with freshly carved corned beef and topped with melty Swiss cheese, tangy sauerkraut and creamy Thousand Island dressing. Arby’s is also featuring a limited-time offer Double-Stack Reuben trade-up option for the month of March, where buyers can purchase a Double-Stack Reuben or combo for only a dollar more than the regular-priced Reuben.